Hafez Al-Assad - Who is Hafez Al-Assad? Born 1928. Hafez Al-Assad was elected president of Syria in 1971 and reelected in 1978, 1983, 1991, and 1999. He joined the Baath party in 1946 and became air force commander after the Baath took power in 1963. He was defense minister from 1966 to 1970 when he seized the premiership. He denounced the 1979 Egyptian-Israeli peace treaty and strengthened Syria militarily. To advance Syrian interests, Assad maintained close ties with the then-USSR (and later with Russia), aided Iran during the Iran-Iraq War (1980-1988) intervened militarily and diplomatically in Lebanon, and backed Palestinian factions opposed to Palestine Liberation Organization (PLO) leader Yasir Arafat. During the 1991 Persian Gulf War, Syria joined the U.S.-led alliance against his longtime rival Saddam Hussein. 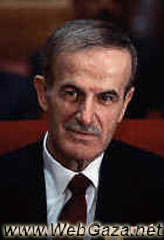 Hafez Al-Assad opposed the 1993 and subsequent PLO-Israeli accords on Palestinian self-rule and the 1994 ending of Jordan's state of war with Israel. In exchange for peace with Israel, he has demanded full and immediate Israeli withdrawal from the Golan Heights, occupied by Israel in 1967. In January 1999, Hafez Al-Assad was nominated for a fifth 7-year term as president of Syria by the Baath party. © 2006 WebGaza.net: Informational Resources about Gaza Strip and Palestine.